Distinguished by enlarged male breasts, gynecomastia is a somewhat common condition that can affect men of all ages. Often beginning in adolescence, the overdevelopment of glandular tissue and/or fat in the breasts that leads to this concern can greatly attribute to feelings of self-consciousness when shirtless, or when wearing clothing that tends to hug the chest. While the specific cause of gynecomastia has yet to be determined, a number of factors are known to contribute to the enlargement of breast tissue in men, including genetics, hormonal changes, weight fluctuations, certain medications, steroids, marijuana use, liver disease, and more. In some instances, however, there is no identifiable reason for the condition’s development at all. At 740 Park Plastic Surgery, Daniel Y. Maman, MD and Stafford R. Broumand, MD offer male breast reduction for the treatment of gynecomastia. By employing the latest surgical techniques, our board-certified plastic surgeons can remove excess tissue/fat and contour the chest for an improved appearance – all in a safe and discreet environment. In addition to enhancing the appearance of the chest, many men disclose that male breast reduction improved their lives in general. Patients both young and old often feel more confident and experience a significant boost in self-esteem, particularly when wearing fitted articles of clothing and/or participating in activities that do not require them to wear a shirt. 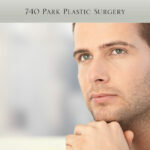 The treatment of gynecomastia is customized to each patient’s unique needs. To begin the procedure, several small incisions will typically be made inconspicuously around the perimeter of the areola. Through these micro incisions, redundant glandular tissue will be meticulously excised until an optimal contour is achieved. Should excess fatty tissue also be present, liposuction can generally be employed to remove fat cells through tiny incisions located in the lower chest. Depending on how much fat and glandular tissue is eliminated, the male breast reduction procedure often takes about one to two hours to complete, but this may vary by individual. Following male breast reduction, most men can expect some minor swelling and/or bruising in the treatment area, though these symptoms should subside relatively quickly. Any potential postoperative discomfort is generally described as mild and can often be managed with medication, if necessary. The majority of patients are well enough to return to non-strenuous work and normal daily routines within a few days of their procedure, but our doctors typically recommend avoiding any heavy lifting and/or vigorous physical activity for a minimum of two weeks. Results will likely be noticeable immediately after male breast reduction surgery, and they should become even more apparent during recovery. The effects of this treatment for gynecomastia can often be maintained for many years with a healthy diet and regular exercise routine. If you are interested in male breast reduction for the treatment of gynecomastia, we invite you to contact us today to schedule a consultation with one or our board certified plastic surgeons.